Wheeler's job will get tougher in January, when Dan Saltzman, his only council ally on the failed ordinance, retires. His replacement, Jo Ann Hardesty is a longtime activist and prominent protester who has been critical of police practices. After a politically brutal week, Portland Mayor Ted Wheeler decided to stop sulking and channel his frustration into action. Earlier this month, just days after the City Council rejected his proposal to rein in potentially violent protests, the right-wing Proud Boys returned to downtown Portland to host a #himtoo rally, itching for another fight with the black-clad Antifa. Following his high-profile failure to win council support for his plan to deal with this kind of volatile situation, Wheeler decided to take his proposal out for a test drive anyway. So on Nov. 17, the Portland police physically separated the warring factions by keeping the #himtoo protesters in Terry Schrunk Plaza (where they had a permit) and closing parts of the adjacent Chapman Square to everyone, thereby creating a buffer zone between the right-wingers and Antifa (which didn't have a permit). The strategy mirrored the vision of the ordinance Wheeler had proposed to the council, which failed by a vote of 3-2. And it seemed to achieve its goal — at least partially — as the brawling took place only after the official rally ended and the Proud Boy crowd tried to head out of town. Wheeler may feel vindicated, but he still has a problem. The practice — if repeated — seems likely to draw a legal challenge. The city closed a public space before any conflict arose, based on the belief that the presence of one group (the Antifa forces) would create a public safety problem. Separating groups who've been associated with violence in the past may seem like a logical solution, but it's what civil liberty advocates said the city can't do and one of the reasons Wheeler's proposal failed to get three votes. The mayor seems to be daring his critics to challenge the practice. That may soothe his bruised ego, but it's bound to come at a cost, even if Wheeler prevails. In a politically active city like Portland, any policy regulating protests must be crafted by a community-informed process, not the courts. It was telling to see who stood by Wheeler at last month's news conference when he unveiled his draft plans to curb protest violence by giving police the authority to move groups of protesters before any problems surface. There was the police chief, who serves at his pleasure. And there was ... nobody else. Not a single City Council colleague. Not the district attorney. Not anyone concerned about the disproportionate number of minorities swept up into the county's criminal justice system. No doubt, the mayor is in a tough spot. No one, including the three commissioners who spiked his proposal, disputes that he's trying to address a real problem. 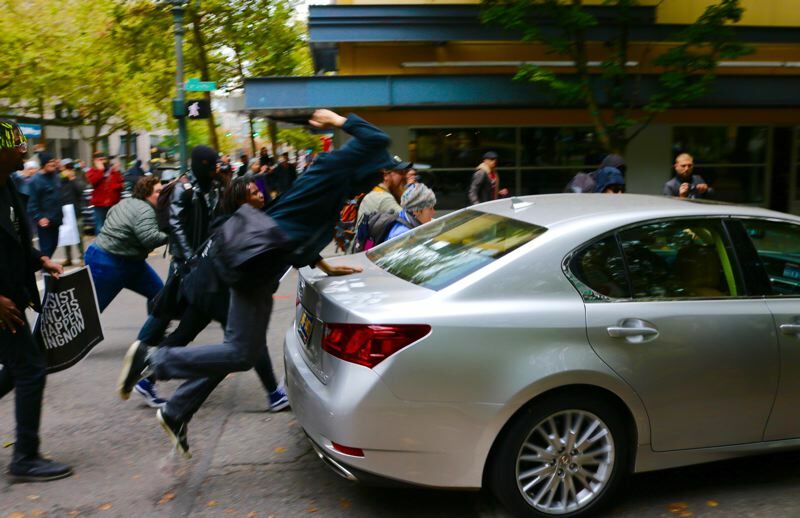 The violent confrontations that repeatedly have marked political protests in Portland over the past two years are bad. They drain police resources from the rest of the city. They put law-abiding bystanders at risk. They discourage visitors, shoppers and others from enjoying the city's downtown. And they discourage people who want to safely exercise their free-speech right to protest from actually showing up. There are lots of people who want this problem solved. It's time for Wheeler to ask for their help. He can start with the local ACLU, which likely will instigate a legal challenge to ongoing efforts to regulate protesters based on how police expect them to express themselves (which is what police did Nov. 17). Members of the local civil liberties group can be inflexible, but that's kind of their job. They should at least be part of the discussion. The same goes for community groups that have longstanding and valid concerns about how police already use their discretionary power. As first reported by Willamette Week, three civil rights groups met with Wheeler in mid-October to lend their support to a measure that would include steps to better monitor extremist groups without infringing on anyone's First Amendment rights. They were rebuffed, but have said they're willing to come back to the table if invited. Finally, Wheeler needs to get the backing of his council. Even if it turns out a new ordinance is not needed, as some suggest, changing the way police use their existing tools will require buy-in from the elected officials. Her ascent to the council presents Wheeler with both a challenge and an opportunity. At the very least, Hardesty needs to know that the mayor values the insights she brings to this topic. He may not get her vote, but he may be able to get her respect — which he'll need on many issues, not just this one. In many ways, the protest policy was a test of Wheeler's leadership. He bombed part one. But rather than a setback, he could turn this failure into an opportunity, as a needed kick-start of an important conversation. If he does his homework, and asks for some help, he may be able to find the right answers.